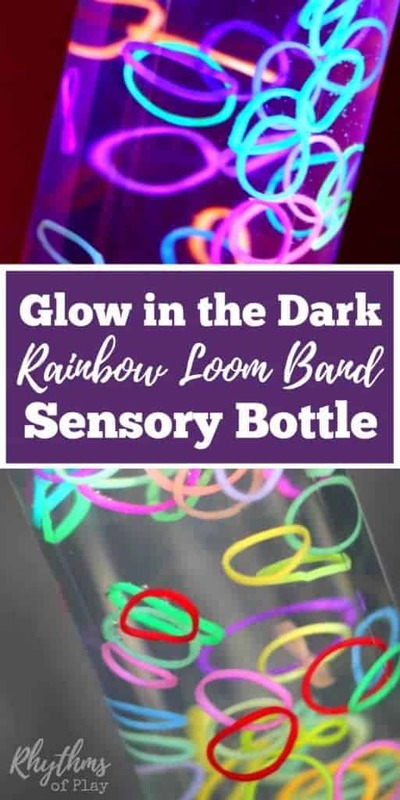 This glow in the dark loom band sensory bottle will keep your kids entertained as the swirling motion of the loom bands calms them. It’s a wonderful bedtime sensory bottle! Sensory bottles like this one are also great for no mess safe sensory play. Placing glow in the dark loom bands in a sensory bottle is the perfect way for babies and toddlers to safely investigate them without the risk of choking. For another fun glow in the dark bottle check out this pet fish. For more information about sensory bottles and their uses check out Calm Down Sensory Bottles 101. These glow in the dark loom bands don’t glow brightly or last long without an external source of light. They can be ‘charged’ by placing them under a regular light or in the sun, but the glow won’t last long. To make these loom bands glow bright a black light works best. The photo on the left was taken in daylight while the photo on the right was taken with a black light flashlight pointed at it. 1. Peel off sticker on bottle. Use Goo Gone to remove sticky residue. 2. Empty and/or drink water in Voss bottle. 3. Fill the bottle half way with water. 4. Drop glow in the dark loom bands into the bottle. 5. Add a few drops of glycerine. This is what snow globes use. It makes the loom bands swirl better than with water alone. 6. Fill the bottle up the rest of the way with water. You want to fill it all the way to the top so there is no air in it. 7. Place lid on the bottle and shake it up. 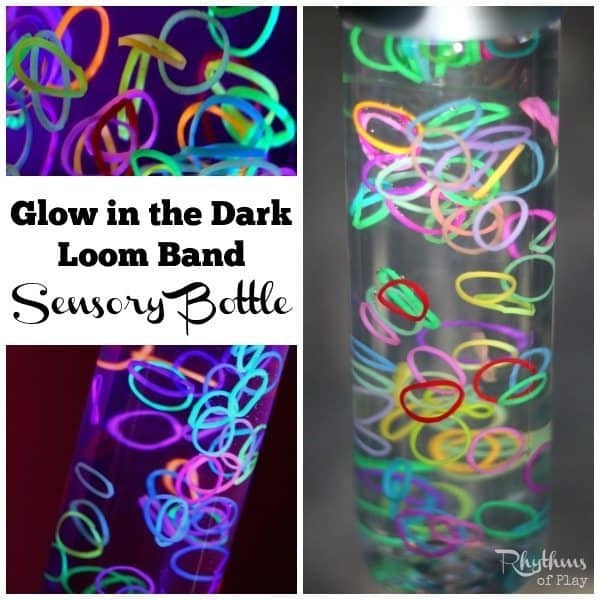 Play with your glow in the dark loom band sensory bottle for a few days before you glue the lid on. You may find that you want to add or remove some loom bands. For another fun glow in the dark bottle check out this pet fish. To learn more about sensory bottles, their uses, how to make them, and troubleshooting tips check out Calm Down Sensory Bottles 101. This post is a part of the monthly Discovery Bottles Blog Hop. Head on over to see all of the other glow in the dark sensory bottles made this month by the blogs below! For more ideas follow my sensory activities plus Pinterest board. Follow Nell @ Rhythms of Play’s board Sensory Activities Plus on Pinterest. I love how this turned out! What a creative way to use loom bands!